Tag Archives: Mark Twain Tonight! Hal Holbrook‘s back in town on Saturday, riding the horse of his magnificent one-man show Mark Twain Tonight!, and even as Holbrook noses up on 87 years old it’s bound to be a helluva show. A couple of weeks ago I chatted on the phone for about an hour with him (Holbrook, not Twain, although it’s sometimes hard to tell them apart), and today two resulting stories have seen the light of print. This one – As Twain, Holbrook’s made his mark – is in Friday’s A&E section of The Oregonian, and is partly about Holbrook’s deepening attachment to Twain’s more politically acerbic side. This one – Hal Holbrook on jackasses and Mark Twain’s wound – is on the online culture journal Oregon Arts Watch and ranges a little more broadly, dropping in on John Updike and Lewis Leary and the enduring controversies over The Adventures of Huckleberry Finn. Where does Hal Holbrook leave off and Mark Twain begin? After 36 years of Holbrook’s solo show Mark Twain Tonight! it gets harder and harder to tell. But one thing’s sure: No humorist alive who’s working in the American language is more deeply and dryly funny. On Friday night, 2,700 people packed Portland’s Arlene Schnitzer Concert Hall as tight as a sardine can. 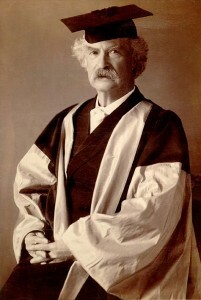 Holbrook (or was it Twain?) provided the salt. Holbrook’s one-night stand was accompanied by the usual appurtenances: a lectern, a library table, a padded armchair, a pitcher of water, a clutter of books. He strode blithely through the usual fog of cigar smoke, wearing the usual Kentucky-colonel creamy white suit. And as usual, he lit a firecracker string of laughter under his audience. “Civiliiizzay-shun,” Holbrook exclaims at one point, turning the word into an impossible contortion that is part wonderment, part delight and part sneer. It was part of Twain’s genius as an entertainer that he could make the most cynically corrosive observations about human nature and phrase them in such a way that his readers and listeners would both recognize and delight in them. To a young country both innocent and destructive, prudish and bursting with desire, he became an avuncular and smilingly savage bearer of self-knowledge. Sin and salvation — the twin excesses of America — are the twin pillars of Twain’s comedy. Holbrook … played Twain’s favorite themes lightly. Stiff-shouldered and shuffle-stepped, with that roiling rasp that is a cadenced, musically scraping sound, he reminisced about young Sam Clemens’ wandering days in Nevada and California and the Sandwich Islands. His apparent rambling – always with a point somewhere around the bend and always delivered with devastating timing – covered the life-saving pleasures of habits (bad ones), the fate of young missionaries who are et by apologetic cannibals, the reason that Irishmen don’t fall on dogs and the impossibilities of the political beast.